another lunch: bento question answered: "what do you do with the scraps?" bento question answered: "what do you do with the scraps?" This question comes up so often! The fate of scraps varies at our house, depending on what the scraps are made of. Cheese scraps - usually eaten right away. I'll eat them if I get an opportunity, but usually I have Ethan or Paige calling dibs on them as cute shapes are being cut. The baby loves cheese and the scraps are usually in perfect baby-bite-sized pieces, so they often end up on his highchair tray. Very rarely cheese scraps will end up in the fridge to be eaten later. Very rarely. There are too many people in this house vying for cheese for the scraps to make it that far. 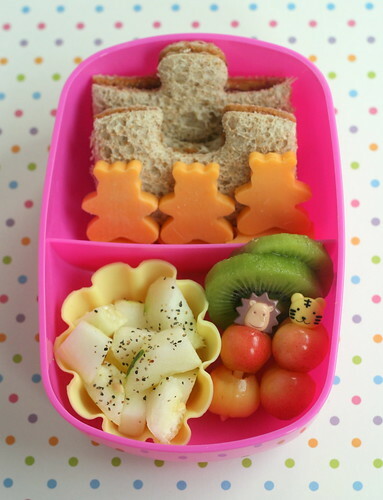 In this bento box you can kinda tell that the bears are propped up on something - that "something" is cheese scraps. You can see a little of it under the bear on the right. Fruit leather scraps - when I'm thinking ahead I make the scraps look pretty to be used on other meals in a cute way - such as Ethan's edible nametag in a lunch or to quickly add a little decoration to lunch on a plate. The real scrappy scraps get collected in a snack sized baggie and used for snacks. It's quick and easy to grab the snack baggie of scraps from the pantry when I'm heading out the door with the kiddies. Bread scraps - the cutters I usually use for making cute sandwiches are Lunch Punch, which are designed to only cut away the crusts. There is very little waste there and the crusts are usually tossed in the trash. Sometimes I'll eat them if I'm starving and lately the baby is gobbing them up too. I don't worry about crusts too much, but I would like to try saving them to make bread crumbs at some point. At some point when I can be organized enough to manage such tasks. 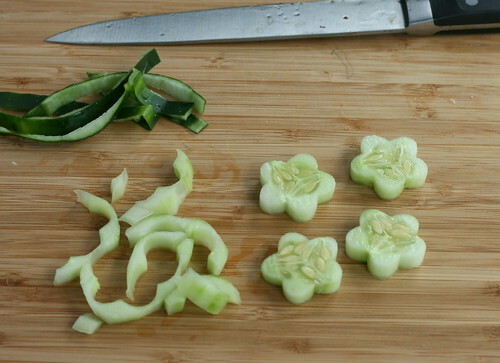 Cucumber scraps - Sometimes the scraps of cucumbers are hiding under the pretty shapes you see in a bento box, sometimes they are fed to the baby or kept in the fridge to be added to our salads at dinner. 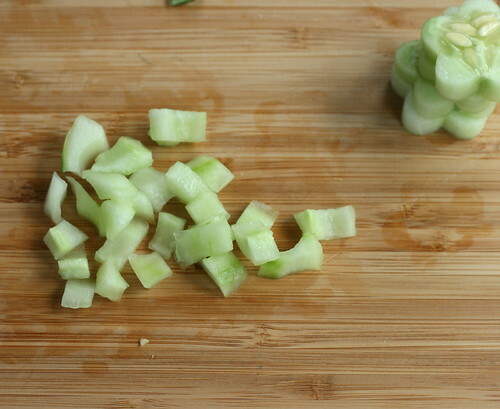 Sometimes the cucumber scraps follow a convoluted path to find their ultimate destiny. Cut the scrap pieces into whatever sized chunks work for you. I was going to feed these to my baby/toddler, so I diced them into pretty small pieces. 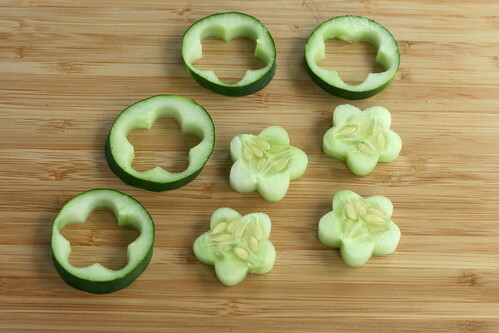 Cute little cucumber scraps ready for baby Tyler! Good thing that cute little bowl has a lid. It gets stowed in the fridge to be used later. If I had a compost bin I'd put the cucumber peel in that. But I don't have a compost bin. *sniff sniff*. Later that day I had to pack snacks/mini-meals for all the kids to take to their playdate/childcare thing and hubby and I got to go out all alone. Just the two of us! Yay! The cucumber bits were packed in Tyler's little bento. Packed in a nibble tray Tyler had strawberries, fishies, multi-grain crackers, salami, cucumber, and mozzarella cheese. It's a Kinderville Little Bites Storage Jar . 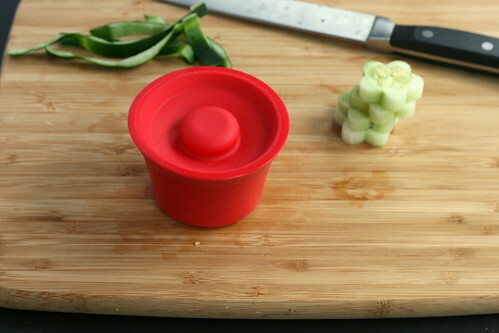 They come as a set of four, made of a really nice sturdy silicone, hold about 3.5 ounces (also come in larger 10oz. size ) and come in very fun colors. 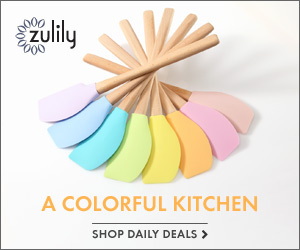 I ordered them from Amazon, I don't know where else they are available. I had hoped I could use them inside bentos, but they are too big to fit in anything other than the Goodbyn. So far I'm finding them really useful to store small amounts of food in the fridge since they are smaller than most of our Tupperware type containers. I am liking that I can take it from fridge, to microwave to child without having to switch dishes. I don't put plastic in the microwave, and our stoneware dishes are not suitable for storage. So before I'd have food in Tupperware in fridge, move to stoneware (breakable) plate for microwaving and then move to a child-safe dish for eating...that's a lot of dishes to go through! 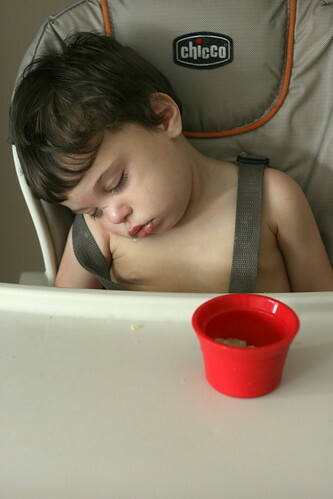 The silicone is nice for the kids to feed themselves out of since the silicone is grippy on hard surfaces, like the table and highchair tray, and don't slide away from them (especially nice for my toddler since he's just learning to use a fork!). I haven't had them very long, but so far I'm loving them. I throw my crusts out my back door (far) into the yard...the squirrels and birds love me for it :) I've also saved them in a big baggie in the freezer for when we go to the park that has a lake. They work well for feeding the ducks. Cheese doesn't last long around our house either! I love your blog. I don't do full on bento's but I use some of the concepts. Right now we use regular lunch bags (custom made by a friend) with cleverly packed recylable containers OR we use some recently purchaced Goodbyn lunchboxes..Have you seen those? Pretty cool. 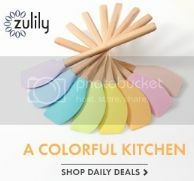 ANYWAY, I was writing to tell you that the Kinderville containers are currently on sale on Zulily.com, are you a member? In fact I got my Goodbyns on sale on another deal site...Let me know if you would like more information or an invite (bansheeonfire@yahoo)...Again, love your ideas! I'm glad to see someone using the Dr. Sears Nibble Tray. I've being longing to get it for a few weeks, but my husband thinks I'm silly. 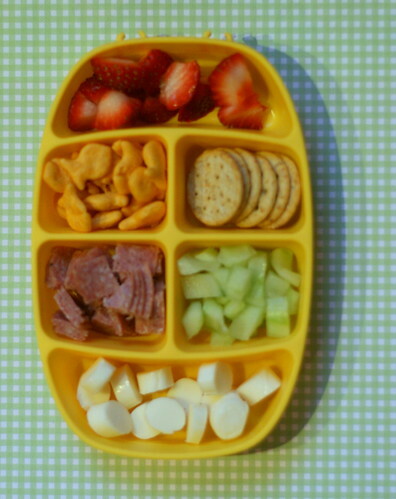 I think the tray would be get to put together a veggie snack tray for the kiddo on the weekends. Thanks for the post. Get back to your weekend! Thank you for this post. It is very informative. You already are way more organized than me. I usually can't see how to use the scraps and they usually get tossed. I have been feeding my 2 yr old twins the cheese scraps. Never thought about making bread crumbs though, or feeding them to the ducks. Bread scraps would be fine for a few days and then I could make a weekly date to the duck pond with the twins who are not in school. You do seem to always get questions about everything! And I'm going to add one too (sorry!). How big is the nibble tray? It looks awesome! But, I can't find dimensions anywhere. We frequently use easylunchboxes and love them, but since my daughter is gluten-free and doesn't like g/f breads, we don't ever do sandwiches. So, the big space often has lots of empty space in it, or is filled with 4 or so baking cups with various foods. She is only 2, so I find that filling the whole thing is often too much food for her. Is the nibble tray comparable in size? Would it fit inside the easylunchbox bag? Or a smaller insulated bag? I'm loving bento-style lunches (and snacks, and dinners!) 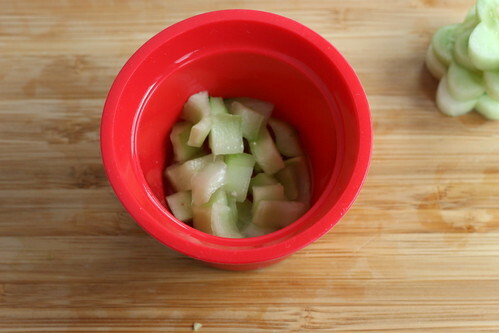 for my sometimes picky toddler, and having a variety of containers is fun for her AND for me. Oh how I love that nibble tray. That would be perfect for my snack loving toddler. Melissa, I keep meaning to ask you what brand of bread you use for your lunch punches? I don't have any lunch punches yet. I do have some sandwich presses and some Target type cutters but the bread I buy seems to be the wrong shape, it is more rectangular than square. I buy Oroweat (Arnold on your coast?) 100% wheat. I have a hard time doing anything fun with it. Shannon, I buy Nature's Own bread from Costco. Do you have that there? And I'm with Jenn -- what's with the people who think the scraps get thrown out? First off, I don't do that, but it's also funny because they act like they never throw any bits of food out ever. My toddler probably drops about 8 times more food on the floor than I generate from bento cut-outs and I'm certainly not scooping that up and putting it back on his tray. I sound like I'm venting, but really I'm just curious about the thinking. Heehee, baby Tyler looks so peaceful sleeping! What a cutie! Great bento and I love that sandwich cutter! I take crusts and loaf ends and toss into a ziploc that I keep in the freezer. When the bag is full, I use the food processor and whirl it down to crumbs and store in the very same bag back in the freezer. I also add new crusts to the same bag. It's very no fuss, no muss. I use my cheese and meat scraps and a sandwich press (like UnKrustables or the circle one from Pampered Chef) and make scrap sandwiches. (Sealing the edges keeps the scraps inside better.) I can eat them 'raw' or butter and toss in a toaster or frying pan and have toasted cheese and ham pockets! 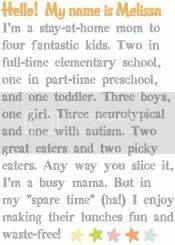 Or if I'm planning a visit to my sister, I bring all the cheese scraps for my niece, who calls them "puzzle cheese" and refuses to share 'her' special cheese! I am so stumped as to how you mamas do all of this! I don't even know where to begin! I need ideas! I have a 2 year old son who will eat anything but I feel so rushed for time to actually get a good filling meal in for him st lunch! Not to mention snacks!!!! Help!!!! !